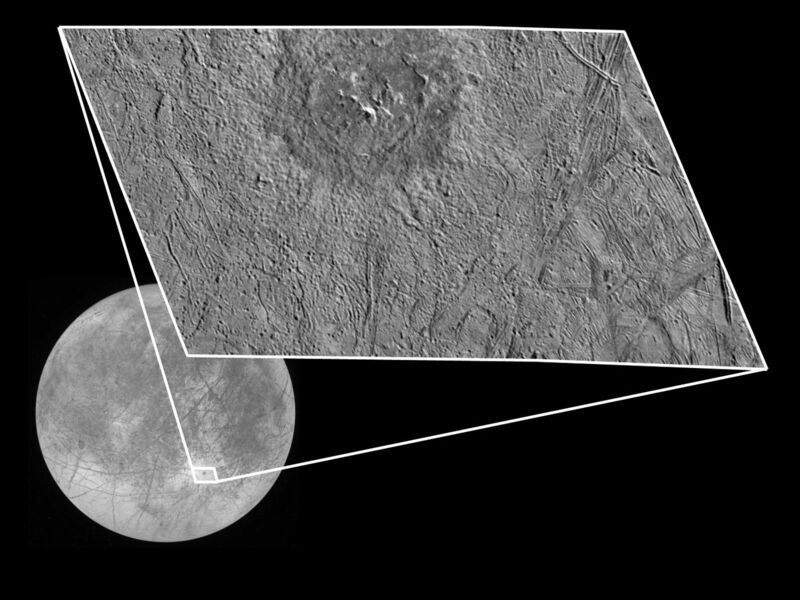 This view of the Pwyll impact crater on Jupiter's moon Europa taken by NASA's Galileo spacecraft shows the interior structure and surrounding ejecta deposits. Pwyll's location is shown in the background global view taken by Galileo's camera on December 16, 1997. Bright rays seen radiating from Pwyll in the global image indicate that this crater is geologically young. The rim of Pwyll is about 26 kilometers (16 miles) in diameter, and a halo of dark material excavated from below the surface extends a few kilometers beyond the rim. Beyond this dark halo, the surface is bright and numerous secondary craters can be seen. The closeup view of Pwyll, which combines imaging data gathered during the December flyby and the flyby of February 20, 1997, indicates that unlike most fresh impact craters, which have much deeper floors, Pwyll's crater floor is at approximately the same level as the surrounding background terrain. North is to the top of the picture and the sun illuminates the surface from the northeast. 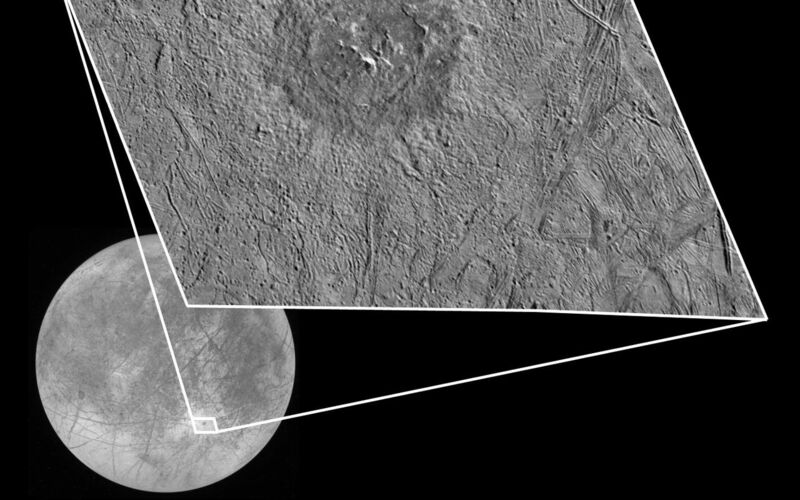 This closeup image, centered at approximately 26 degrees south latitude and 271 degrees west longitude, covers an area approximately 125 by 75 kilometers (75 by 45 miles). The finest details that can be discerned in this picture are about 250 meters (800 feet) across. This image was taken on at a range of 12,400 kilometers (7,400 miles), with the green filter of Galileo's solid state imaging system.